We've got another great savings opportunity for you with this pocket knives Mystery Bag! 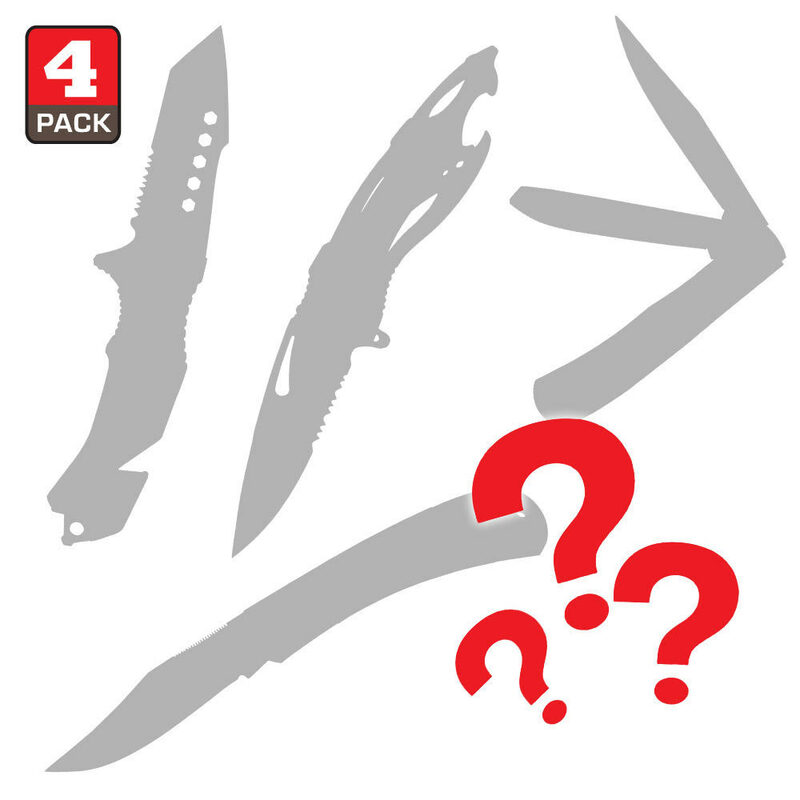 For less than $20, you'll receive a combination of four folding pocket knives in this mystery bag. These products are brand-new, never-opened and we are selling them at this unbelievable discount rate because we no longer have enough of the individual products to maintain a location in our warehouse. So we mixed them altogether in a giant box and we just pull random items from the box until it's all gone. We will continually restock these with different products as our inventory levels change. We're excited about passing along this opportunity for incredible savings to you. The value of this bag is GUARANTEED to be more than what you pay. It'll be just like opening a present when your mystery bag arrives! Good deal for the price, pleased with the knives received in this mystery deal. Brand new, good quality knives to add to the collection. Only complaint is that 2 knives we're the same knife but different color (1 black and 1 blue). I was a little sceptical about ordering a "mystery" deal, I was thinking it would be a bunch of junk that nobody wanted. I was proven wrong as soon as I opened the box. I was so impressed by every item that was in the box. Everything was Geat quality and Great shape! I was not expecting such great quality for the price I paid! I love it! I will order more, this experiance made me a customer for life! I was super stoked to open these knives!! I would definitely give it another go as i was impressed with what i recieved. 3 spring assist knives (one stilleto, one karambit, and one regular knife) and one not. Each one unique and if not functional really cool to look at and play with!! I feel i got my money's worth and more!! Thanks budk!! I like it a lot! The only reason for four stars is because I got some kissing crane pocket folders that personally I would never have gotten. But I got a stiletto and a couple assisted opening knifes I'm very pleased with for the prove. 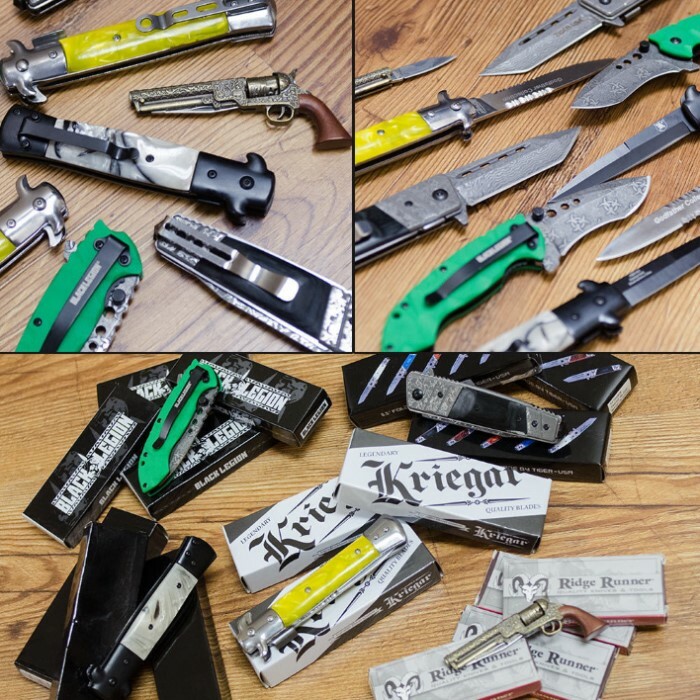 I purchased the mystery pocket knife set and received pretty much the same thing as Scott Wise, however the rescue knife is sturdy even if it's not assisted opening, the pocket knife and fork combo I received is beautifully made, and the wavy dragon blade is pretty cool. The only gripe I have is the extremely cheaply made straight razor with a plastic handle and the design on the blade half worn off. All in all it's a nice deal and the surprise was rather fun, while I'm not sure I got my full money's worth out of it I still got some really nice blades.